I've been doing a lot of research, but first here's my background. I live in a Beach City, near Sao Paulo, Brazil. 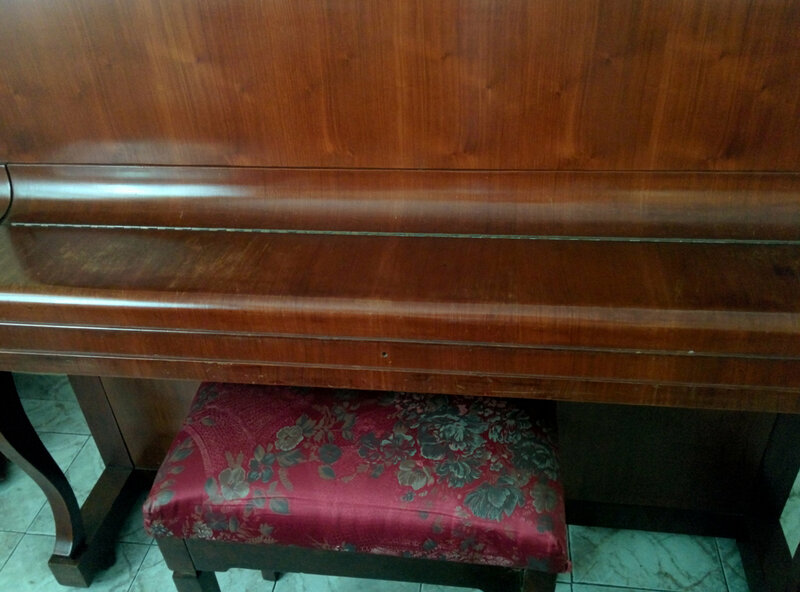 My grandfather has bought me a piano years ago, at an auction for R$ 900 (in today's currency it would be like $300, but since this was years ago, I don't have an actual reference). But by all means, I have to admit it was a real bargain. Though I'm no professional musician, I absolutely love my piano. I have never done any courses, but I usually spend 1 or 2 hours everyday learning online and practicing on it. Of all my hobbies, it's the one I enjoy most. So while I don't really want to spend a lot of money, I'm all in for investing more than a grand or 2 on a piano. About the piano, it's a national vertical Piano, Otto Halben, but you see, it's not well preserved. Partially because I was too young to care before, and partially because I can't find a soul here in this city that works with pianos. It's just not a common thing here. As you can see, it looks quite old from the outside. Also, I believe it's somewhat out of tune: If I play a music simultaneously to a, let's say, youtube video, I can clearly notice that the notes sound slightly different from one another. 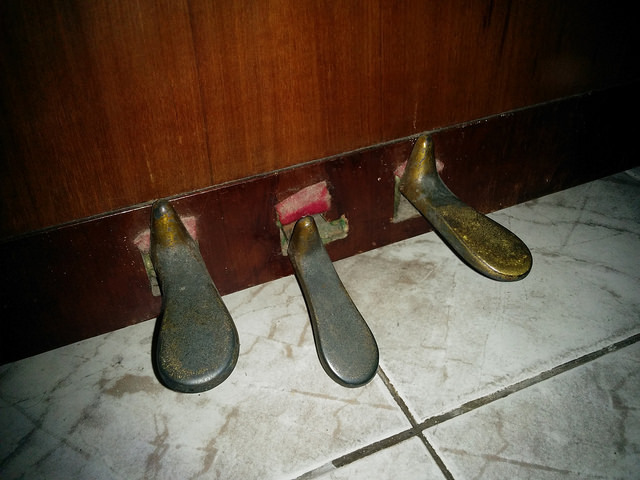 As you can see one of the pedals (the middle one) is also broken. Despite all those problems, I quite enjoy the sounds that come from it. It's VERY different from most keyboards I've ever played on. It's not "artificial". It's very sensitive, and if I would compare both, I'd say the piano is a human, the keyboard is a robot. That being said, I know this isn't a website for opinions, and though I've post a lot of personal photos, I'd like a straight-forward advice about the similarities between a good ole piano and digital one and why should someone get one rather than the other. I've always been told that if you have the money, you should get a full-fledged piano. But in my understand some digital pianos seem almost as good. Also, I'm thinking a lot about a digital piano because I don't want to bother people with my practice sessions, currently I'm forced to play just a few hours during the day. A good digital piano is better than a bad acoustic piano. And I'm thinking this is the case. Either that or I could play a simple keyboard to practice during the night, and try to restore my old piano somehow. For you guys who had both (an acoustic piano and a digital one), am I being ridiculous on the idea of replacing it for a digital piano? Try asking at churches etc. to find who looks after their pianos. An acoustic pianos will tend to feel more responsive, if that's the term, than keyboard types, unless you pay thousands. Yours appears to be not a bad one, the broken pedal should be an easy fix - it looks like it's the one that operates the practice mode - very quiet - which could be invaluable to you. It could be a great opportunity to learn how o tune a piano! The tools needed are not too expensive, and you may even enjoy the experience! Whilst I have and play both kinds of 'board, the piano has a stronger attraction. 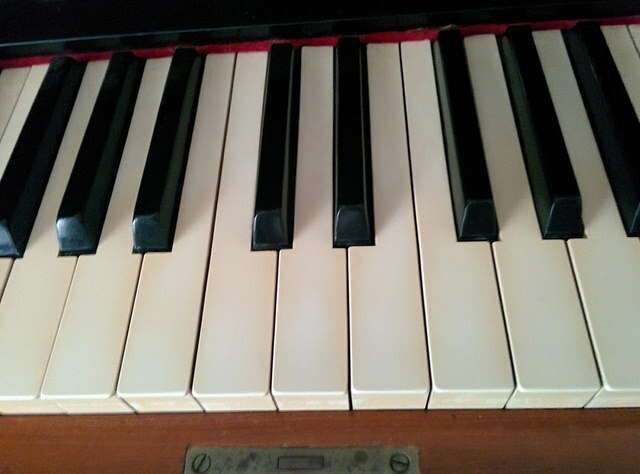 Yellow keys are not problematic, and the case, if not split, won't affect the piano's sound. Just call it patina. I would never ditch an acoustic piano, even a spinet. I move around a lot and live in small apartments so I'm stuck with a digital piano and every day I wish I had a real piano. I suppose your question is really an opinion question. My opinion is a bad acoustic piano is better than a good digital one. I have had real acoustic pianos and digital/electronic pianos. But due to moving more frequently I sold my acoustic piano about 7 years ago and now I have a Yamaha 88 weighted key piano that I can move by myself. I don't see why you can't keep the vintage Otto Halben as both a collectors item, and something you may want to have restored one day. But you could buy a digital piano to play in the mean time. The advantages of a real piano are as you have suggested, they seem to have a soul (spirit) of their own - more like a living, breathing thing. There is something intrinsic about playing a real piano that you can never get from a digital piano, no matter how good the digital piano sounds. And there are not any digital pianos in your budget that can replicate all of the nuances in feel and sound that your Otto Halben can produce. I would expect that for most people - the sheer joy and satisfaction of playing a good quality in tune real piano - would be much greater than playing any digital piano. But, the advantages of a digital piano are portability (you can even move it from room to room in your home) the opportunity to practice and play without anyone else hearing you, and the ability to transport your instrument to play in other places outside your home should an opportunity arise. Beyond that, most will offer multiple soundscapes and the ability to emulate many other instruments such as an organ or electric piano. Most will also allow you to transpose a piece of music to any other key - while playing in the key you have already memorized for a particular song. And as some have mentioned - you don't have to have it tuned. Also, you can adjust the tuning slightly to play along with recordings which may be slightly flat or sharp, or with other instruments that are not easily tuned to a piano (woodwinds and some other horns). If you ever wanted to record your piano, most digital pianos will allow some form of direct connection to a computer or recording device without a need for a microphone. Whereas micing a real piano is a logistical challenge to say the least. If you can afford to buy a fully weighted key digital piano, and keep the Otto Halben, that's what I would recommend. Later if you find someone who can repair, restore and tune the Otto Halben, you can use the digital piano to practice at night when your neighbors are asleep, so you can entertain your neighbors during the day by playing beautiful music on your beautiful Otto Halben. Also the Otto Halben will be something to remember your grandfather by. The lifespan of a digital piano can be much shorter than an acoustic piano. An electronic device may last only a few years before breaking down beyond repair. 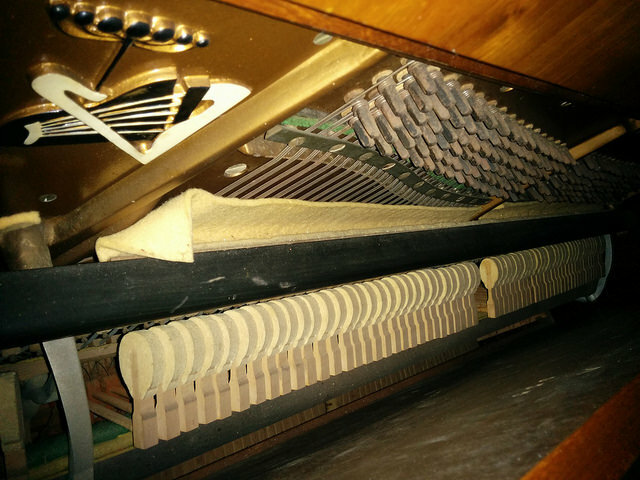 A well maintained piano can last generations. To give you some examples, in my lesson studio we use digital pianos in practice rooms that are too small for the acoustics. I have been replacing them at an average of every four years due to electronic or mechanical problems. In one case, out of the three Casios I bought, two failed in the first year. Even under warranty I still had to pay for shipping the units to an authorized repair location, and they are heavy objects. In the older digital pianos I have (about ten years) the silicone keyboard sensors are starting to wear out and crack, creating key problems. Because the models aren't manufactured anymore, there are no replacement parts available. One of the acoustic pianos I have is over 80 years old and still going strong, even with daily playing by students seven days a week. The other three are decades old also still in excellent shape. 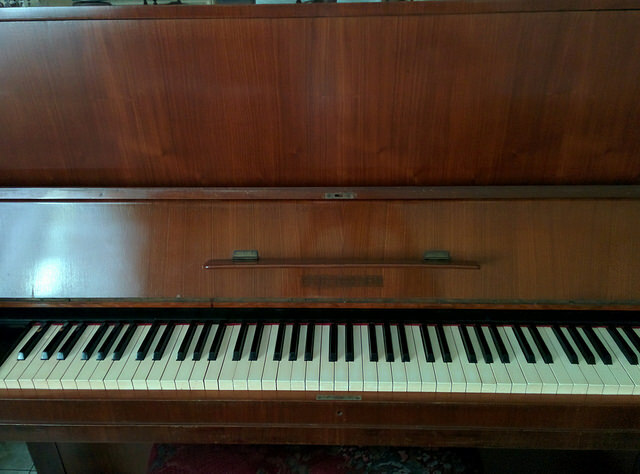 If you have the space for it and the piano is a good manufacture then I highly recommend spending the money on the repair and upkeep rather than replacing it with an electronic one. The only picture that matters is the interior of the piano. That looks quite hopeful. You say it seems out of tune. Have you really been playing it for several hours daily and never had a piano tuner visit? Who installed the mute - that strip of felt that can be raised between hammers and strings for quiet practice? Anyway, call a tuner in and listen to what he tells you. 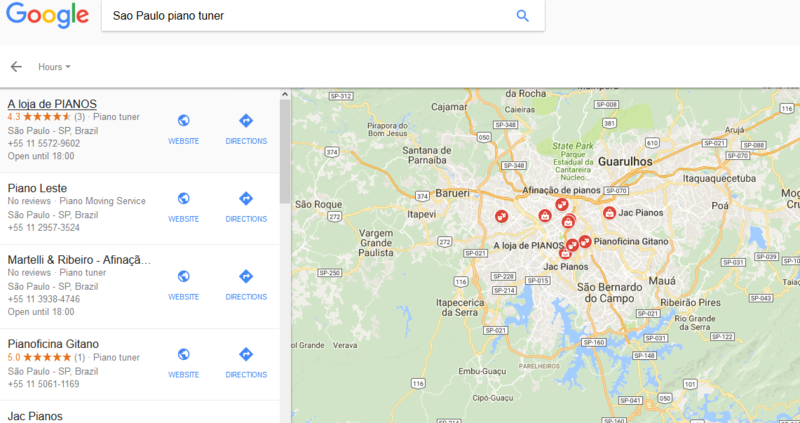 I've just Googled 'Sao Paulo piano tuner'. There are quite a few! Not the answer you're looking for? Browse other questions tagged piano maintenance digital-piano or ask your own question.